"People were afraid to go to sleep, and scared that they'd be next." LEWISTON — On May 3, 2013, Ashley Medina stopped by her mother’s house with her two young children in tow. She put in a load of laundry and took a shower. When she finally picked up her phone, she had missed dozens of calls, texts and Facebook messages. Her apartment building at 114 Pierce St., where she lived with her 6-year-old and 2-year-old, was engulfed in flames. Friends and neighbors were calling to make sure she and her family had made it out safely. “People were freaking out, thinking my kids and I were inside,” she said. The fire, set in a condemned building at 116 Pierce St., had jumped quickly to adjacent buildings that housed dozens of people. Medina rushed to the scene to make sure her neighbors had made it out. Along with countless others, she lost everything she owned. It was the second arson fire within a week in Lewiston’s downtown. Three days later, there was another, and the fear and tension among neighborhood residents skyrocketed. 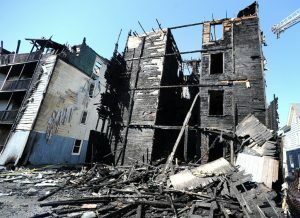 In all, nine buildings were destroyed, leaving hundreds homeless and wondering where or when the next fire would occur. Five years later, there has been immense change – both visible and in policy – in Lewiston. 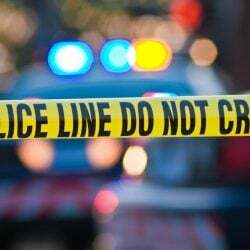 Code enforcement and fire inspections entered a much stricter era. Condemned buildings have been knocked down at a pace not seen elsewhere in Maine. While there are new apartments on Pierce Street, the other fire sites remain empty lots. 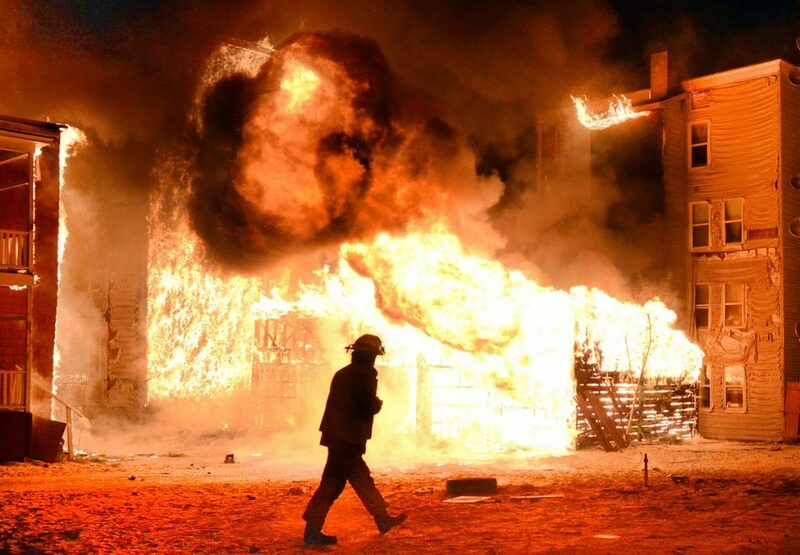 People who were on the streets in 2013 – residents, neighbors, officials and firefighters – spoke to the Sun Journal this past week about how the city changed after suffering three horrific fires in the span of eight days between April 29 and May 6, 2013. Craig Saddlemire, who lived in the neighborhood, witnessed the first two fires. On Pierce Street, he remembers crowds of people in the streets almost standing in silence, mesmerized by the destruction. The power went out and the only light came from the rising flames. 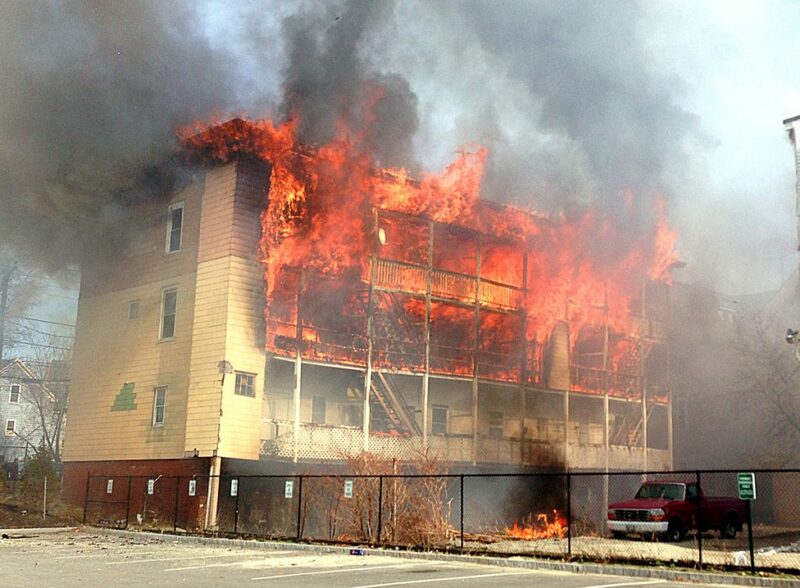 Flames consume an apartment building at 111 Blake St. in Lewiston in 2013. Hundreds were left homeless in a series of arson fires in the city that haunt residents there still. A few days earlier, Adilah Muhammad, who was eight months pregnant, found out that the building she owned with her husband at 82 Pine St. was caught up in a blaze that had started at 105 Blake St. Burning pieces of material from the condemned building cracked and flew onto the roof of Muhammad’s building, which had 10 apartments. Remembering the fire this past week, Muhammad was still visibly shaken at the thought of a 19-year-old woman who had just moved into the building with her infant. Those who were members of the Lewiston Fire Department remember most that no one was killed or seriously injured in the three fires. Shortly before the Pierce Street fire was reported on May 3, every Lewiston fire unit was on Pinewoods Road for a reported fire that turned out to be nothing more than a bonfire. Rick Cailler, president of the Lewiston Firefighters Association union, said the bonfire ended up saving precious time when the Pierce Street call came in. Cailler worked two of the fires that week and was incident commander and first on the scene at Pierce Street, the most devastating of the three. Cailler said that despite the city living in fear and people’s lives being turned upside down, the Fire Department received an immense amount of support from the community. Each day, people dropped off food at the fire stations. Lewiston’s fire chief at the time, Paul LeClair, said that like the rest of the community, he had “a great deal of difficulty comprehending” why the arsons were taking place. LeClair said it was amazing to receive help from so many neighboring fire departments, including those in Auburn, Lisbon, Sabattus, Poland and Greene. The backs of two buildings on Bartlett Street in Lewiston show the damage after the 2013 fire. For the neighbors, it became a time to lean on each other. Medina said the overwhelming community response helped to stifle some of the fear that gripped the neighborhood. Saddlemire, then a city councilor, organized a gathering in Kennedy Park to recognize the pain felt in the community without pointing blame. The American Red Cross set up an emergency shelter at Lewiston High School. Fundraisers were spearheaded by the United Way and the YWCA, among other agencies. Gov. Paul LePage donated $50,000 to a relief fund. The city received so much support that officials had to tell people to stop donating. When Medina finally found a new place to live two months later, it was almost completely furnished by items donated during the fundraisers. “It felt like home when we moved in,” she said. Brown said that after the Pierce Street fire, he walked the streets, trying to help any neighbors he could. He also had to find a new place for his mother-in-law, who had lost her home. At night, any sound would wake him, and he’d go outside to look around. He wasn’t alone. After each successive fire, more fear set in. Police patrolled the streets. “People were afraid to go to sleep, and scared that they’d be next,” Medina said. When the first fire hit, at Blake and Pine streets, City Administrator Ed Barrett remembers walking out on the front steps of City Hall and feeling the heat from the flames hundreds of yards away. He remembers getting a call in the middle of the night about the Pierce Street blaze. Then the same thing happened again three days later. After the fires, four people – including two 12-year-olds – were charged with having set them. City officials spearheaded a large campaign to secure and clear waste and debris from abandoned or condemned properties. All three fires were set in condemned buildings, then spread to the buildings next door. The city continued its overhaul of how code enforcement and fire inspections were handled, and as a result, the next three years saw an unprecedented number of building demolitions. Gil Arsenault, the director of Planning and Code Enforcement who is retiring next month, said at the time of the fires the city already had begun efforts to address problem properties. The statistics show it. In 2010 and 2011, two buildings were demolished each year, but in 2012 that number rose to 11. Since the 2013 fires, the city has demolished 63 buildings, including the buildings destroyed in the fires. In all, 176 apartment units have been demolished since the fires happened. “People don’t do this,” Barrett said of the amount of demolition in Lewiston. Barrett estimated Lewiston has torn down more buildings in the past six years than the rest of the state has in the past 20 years. Barrett was city manager in Bangor for 20 years, and he believes the city took down two buildings in that time. The city estimates the cost of demolishing the 63 properties at $2.1 million. Barrett said roughly half has been recouped from landlords and banks. “We had a bank that tried to sell a property after we had torn it down,” he said. The estimated value of the nine properties at the time they were destroyed by fire was about $2 million. Arsenault said that in 2011, the council recognized “we had a real problem,” and allocated more funding for code enforcement. Part of that recognition was the result of community-led advocacy for safe housing by neighborhood activists. The department has two more staff members than it did at the time of the fires. Now on the edge of retiring, Arsenault believes the city is “ahead of that giant backlog” of dangerous buildings. Since the fires, code enforcement has had a policy of gaining compliance or initiating court action. “If you don’t cooperate, if we don’t see a reasonable response, we’re going right to court,” Barrett said. “I think they take code complaints more seriously now,” Muhammad said, adding that before the April 29 fire, she and some of her tenants had complained about the condemned building at 105 Blake St., where the blaze was set. According to city records, the Blake Street building was under eviction notice at the time of the fire. Arsenault said he doesn’t want people to lose sight of the fact that all three fires were arson rather than fires that resulted from electrical or other problems. The 12-year-old charged with setting the Blake Street fire lived in the building. After the fires, many who lost their homes on Pierce Street advocated for the structures to be rebuilt, but the effort was met with resistance. A ribbon-cutting at Pierce Place, an apartment complex containing 29 new units and 33 renovated units, finally was held last year, four years after the buildings came down. Saddlemire serves as coordinator for the Raise-Op Housing Cooperative based on Pierce Street, which sells shares to tenants, giving them a say in decisions about building maintenance and upkeep. The City Council recently gave the organization a Spirit of America award, which commends community service. “I think there were a lot of things that led to the creation of Raise-Op, but I do think that (rash of fires) was one that moved a lot of things to action,” Saddlemire said. He said that at the time, there seemed to be too many obstacles for people to find safe, affordable housing. After the fires, he said, he encountered many people who had the reaction of “let it burn and don’t rebuild,” as a way of cleaning out the neighborhood of properties – and perhaps people – who were unwanted. “I don’t think they quite saw up close how profoundly this stuff affects people’s lives,” he said. At Raise-Op this past week, Muhammad said discussing the root of the fires, and the state of housing downtown, can often result in rifts between residents and landlords or city officials who may have different views on the best path forward. For members of Raise-Op, the downside of the city’s overdue pressure on landlords has been the loss of housing units, which has crunched the market. Saddlemire said he was happy with the city’s reaction after the fires, but that the sheer number of demolitions that resulted was a double-edged sword. Aden Hilowle, a new member of Raise-Op, said many of his friends and family lost their homes in 2013. Some found places to go in Lewiston, but some moved as far away as Rhode Island to find new housing. In the years since, some have begun to return to Lewiston, he said. Last month, Lewiston officials and neighborhood advocates celebrated a $3.1 million federal grant aimed at planning and executing comprehensive revitalization projects in the downtown. Nearly half of the residents in the area where the three fires occurred live below the federal poverty level, and the childhood lead poisoning rate is three times that of the entire state. The grant is intended to address some of those problems. While Pierce Place has been open for a year, Barrett said finding people willing to invest in new housing projects on the former fire sites is difficult. Most of the time the cost to develop, on small lots especially, exceeds the income that can be produced from rents, he said. Part of the grant received by Lewiston covers a market study, which Barrett said the city hopes can provide a better understanding of the financial issues that need to be addressed to encourage more investment downtown. For code enforcement officials, the next step might be implementing a rental registration program, which requires landlords to submit contact information and pay a fee for each apartment unit, making it easier for the city to keep tabs on rental properties. Through the heartache, some have seen a silver lining. After losing her home five years ago, Medina said the fire ended up changing her life for the better. Inspired by the advocacy and community spirit she saw in the wake of the fires, she changed career paths. She’s involved with Healthy Neighborhoods and is a mentor and vocational coordinator for Goodwill’s Take 2 YouthBuild, a youth literacy program. She advocated for the Pierce Street buildings to be rebuilt and her children stood at her side holding signs. When they drive past now, her children remember that they used to live there. “It inspired me, and here I am today,” she said.